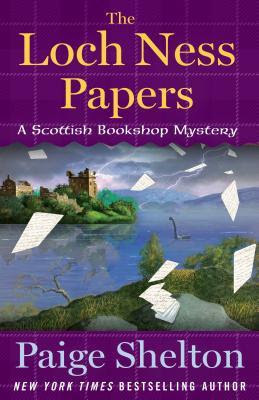 I'm always looking for new to me cozy mysteries so when I saw The Lock Ness Papers at Netgalley and learned it was part of the Sottish Bookshop Mystery series, I had to request it. It is book 4 in the series, and I haven't read the previous books, but I still really enjoyed it. While you can tell the relationships have been developing over the course of the series, the mystery is definitely a stand-alone. I think it helped me that Delaney's family were visiting for the first time, so there were plenty of introductions to introduce a reader to the cast of regular characters. 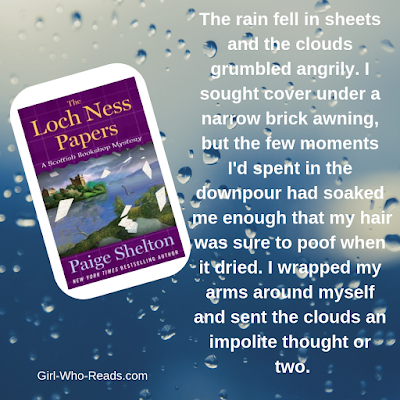 Have read MC Beaton's Hamish Macbeth series, I knew I liked Scottish mysteries and I'm thrilled to be able to add Paige Shelton to my list of must-read authors. I loved getting to know Delaney Nichols, her bookshop family, her Scottish family, and her family from Kansas. It is a delightful cast of characters. I liked that Delaney and her boss, and fellow amateur detective, Edwin were the kind of characters that are an annoyance to the local police. They seemed to be liked and respected by Inspector Winters. Delaney is also not nosy. She is curious and with her background in research, it makes sense that she would be drawn to mysteries and people's stories. In this story, there are two mysteries. One, is the monster of Loch Ness real? And two, who killed Gavin, the great-nephew of a local (and somewhat famous) monster hunter? Both mysteries tie together nicely as well as provide some Scottish history. There is also a bit about King Arthur. The Loch Ness Papers is a light read and more about finding out family history. The characters are never really in any danger nor are there really any high tension moments, which I appreciated after reading some high anxiety-inducing thriller. It was just a really enjoyable story. I do wish we had found out what happened to the dress shop owner and seamstress. Perhaps it will be revealed in a future book and be sure I will be picking up future books in this series (as well as going back and reading the first 3 in the series). Linked to First Chapter, First Paragraph. I really liked the cover and the opening paragraph is a great introduction to the character. I can relate to the hair thing too. I like the intro, and it sounds like what happens a lot here in Florida. It happens pretty regularly in Georgia too. Love when you can step into a series and not be lost. I think that is a mark of a great cozy mystery series. I love this author. This book is on my list. This is the first book I've read by her, but I'm going to keep reading her.